We've got a new challenge for you at Seize The Birthday, and this time our optional topping is Water. 'So, where's the water? ', I hear you ask. Well, rather than depict water, I decided to use water. I bought this really cool handmade paper a while back. It's full of collaged movie posters images so all I had to do was sprinkle on some Brusho powders, spritz with water then cut to size. Added some Tim Holtz celluloid strip and a sentiment, and it's done. Part of the paper includes a poster image of Titanic, which looked great spritzed with blue Brusho, but given the outcome, it's not really appropriate for the front of a card, is it? 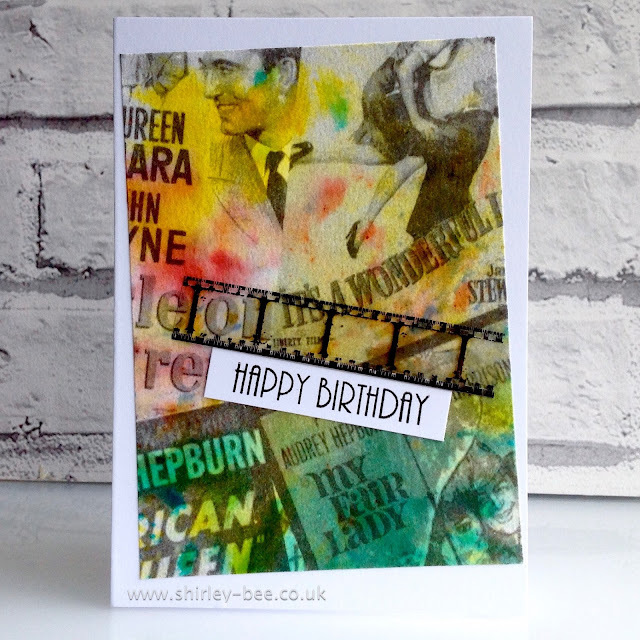 Pop on over to the Seize The Birthday blog for some more fabulous inspiration from the Design Team, including our two new teamies, Vicki Dutcher and Barbara Campbell, and the last project from our current Guest Designer, Jacquie Southas. Don't forget, the topping is optional, so if you don't want to use the water theme, any birthday project is fine. I am loving this card! The old movie posters images are fabulous....what a great paper! Love the added colors too. Great card with all those old movie posters. Very creative to use real water on your card technique. Fabulous card and I love the brusho background, great idea! Way to think outside the box Shirley! It's such a brilliant idea and your letting our followers know that you can use their imagination with our topping! Love the results and what cool paper...you are always the clever one! Have a great day! This is so cool!! Absolutely love it - such great colours. The Mixed Media Card Challenge - Are You Playing?